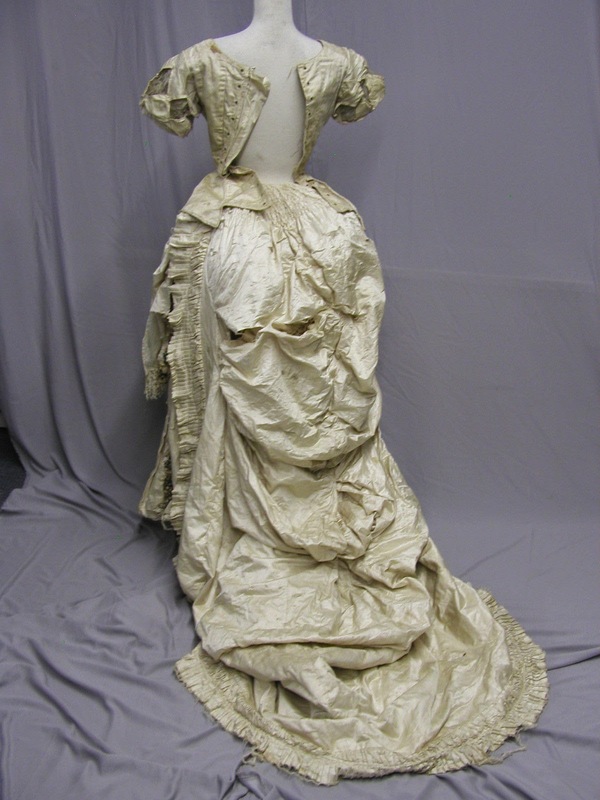 #1004, 1880's Extraordinary Silk Bustle Wedding Gown Wax Orange Blossoms: This 1880's ivory silk wedding gown had to be custom made. 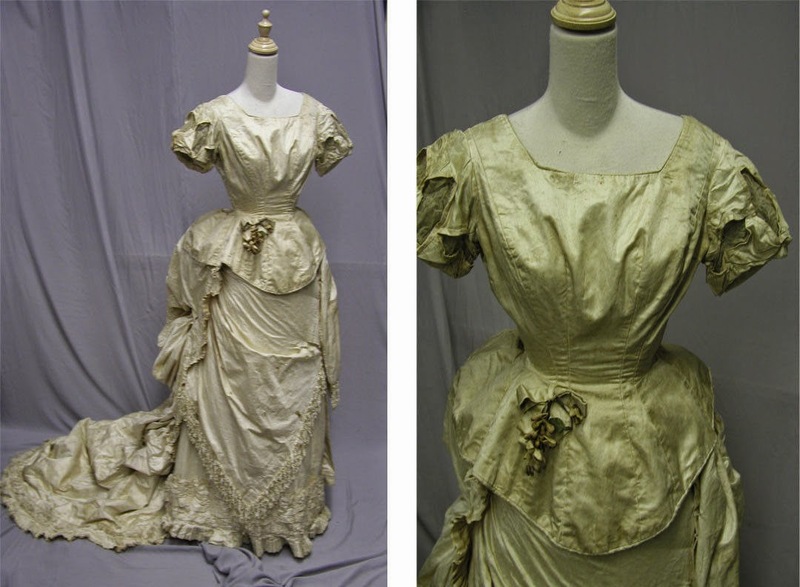 The bust is 30.5 inches, the waist is 19 inches. The shoulders are 12.5 inches, and the skirt length in front is 39.5 inches. 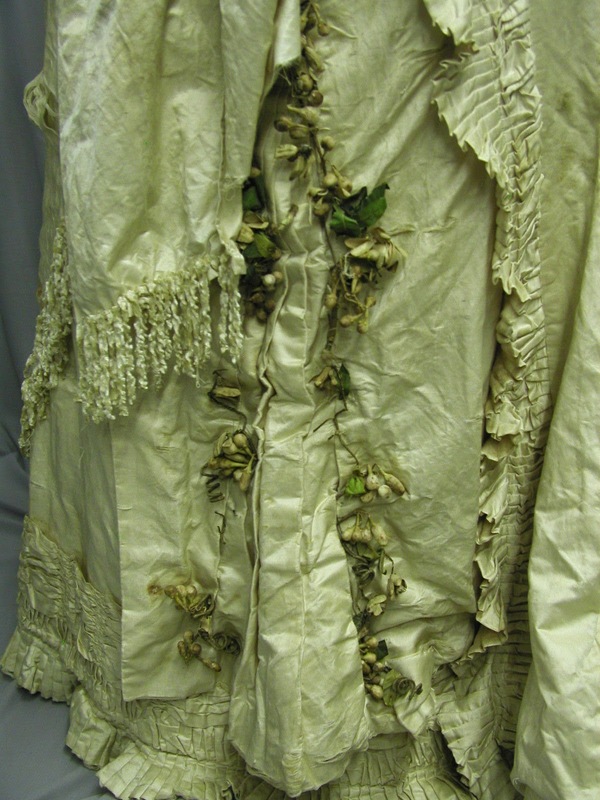 It is the height of fashion for this time period and it is rare to find one that looks like this. It is so sad that it was not properly cared for. While the style is incredible, the condition is horrible. 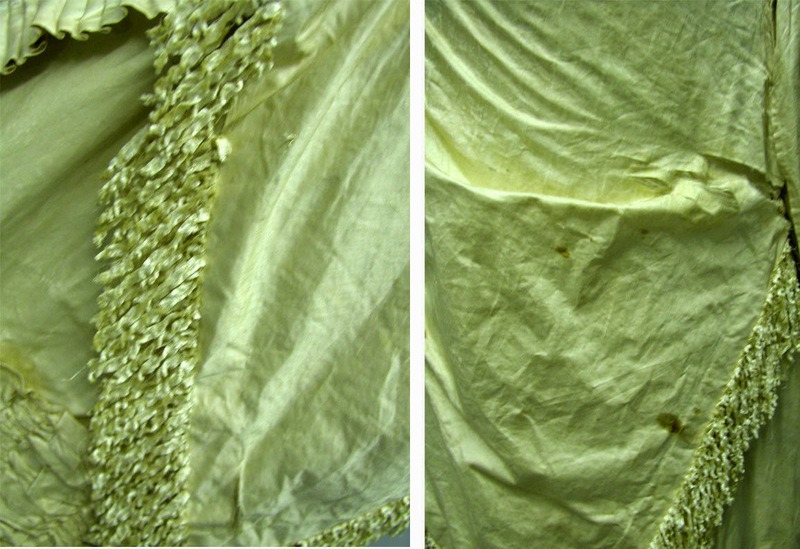 The silk has splitting, stains and holes. 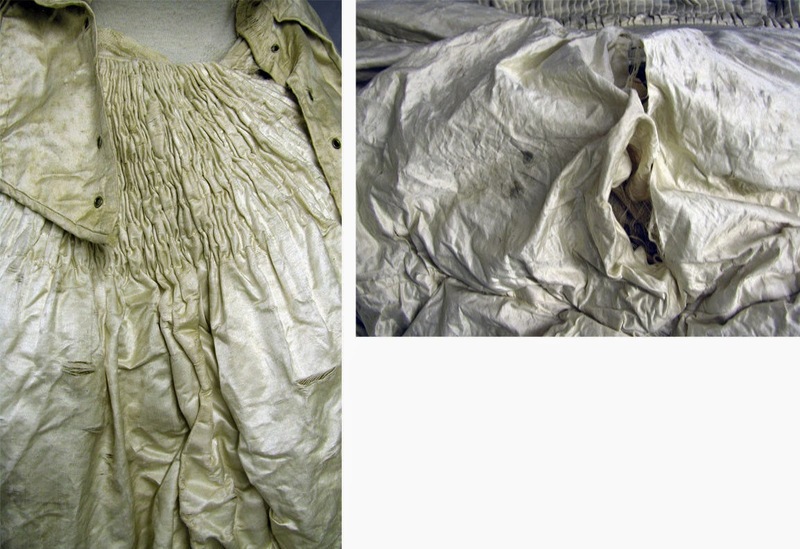 The basic part of the garment skirt tears when you touch it if you are not careful. 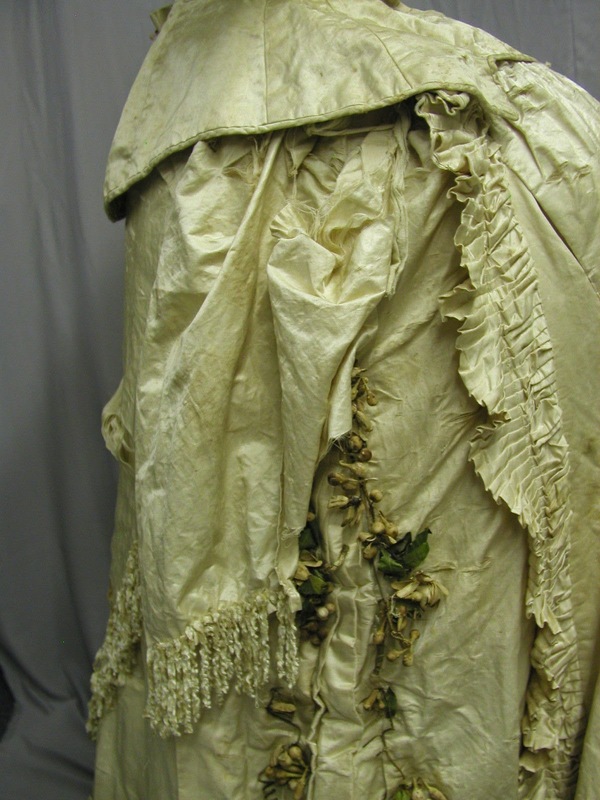 The best part is all of the lovely pleading, ruching and silk fringe which would be wonderful to use in making antique doll clothing. This could never be worn. It cannot be stabilized. 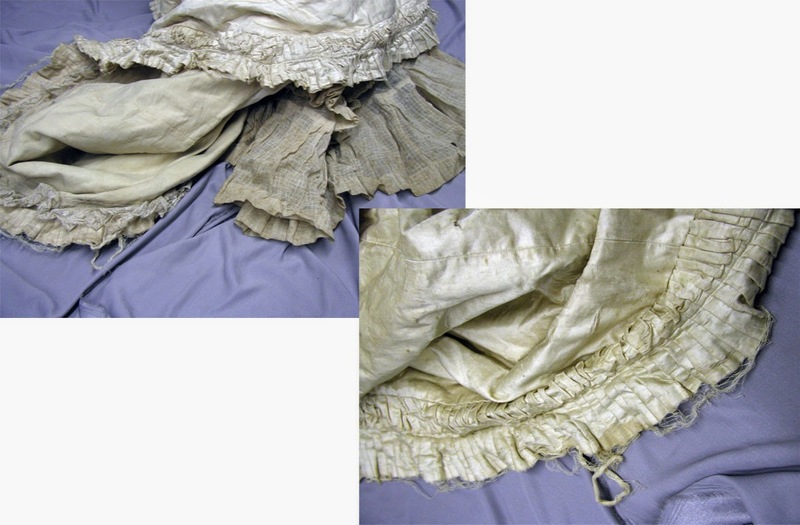 It does have a built in underskirt train and one row of pleated lace around the back. I have posted many photos so that you can see many of the issues. I don't know if you can clean the wax orange blossoms. The bidding will start at $0.99 with no reserve. Good luck and have fun. 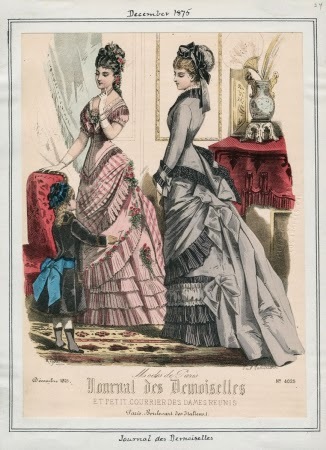 We are listing some other magnificent garments this week. 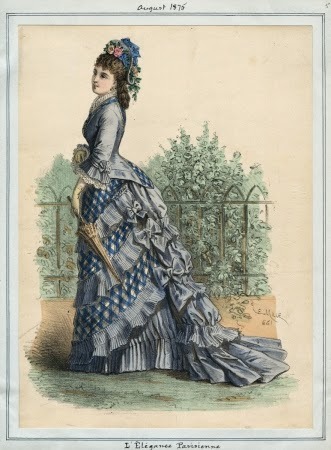 Each of the following was taken from Casey Fashion Plates at the Los Angeles Public Library. 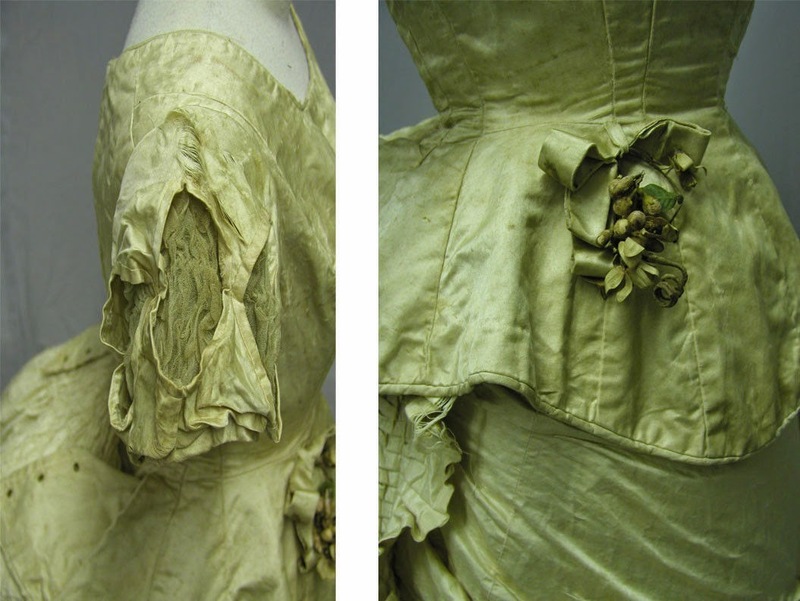 They are all from 1875 and each has an element similar to the gown above. 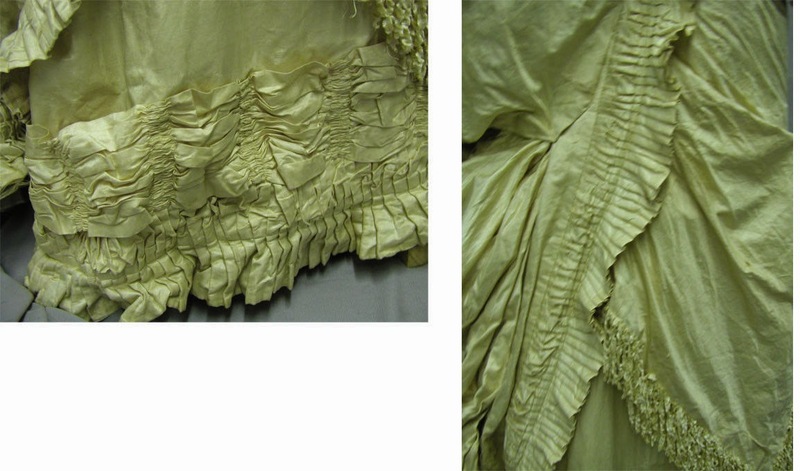 The basque waist, the way the bustle "pillows" out in the back, the type of fringe used - each of these elements point to an 1870's date. My guess is 1874/1875. 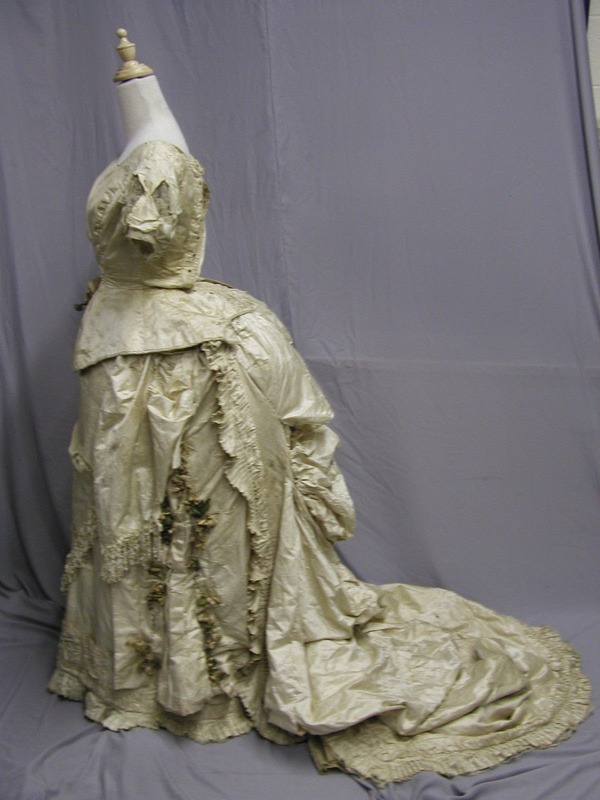 And yes, it is a Wedding Gown. The orange blossoms point to that. Wow! Even as fragile as it is, it sold for a pretty penny. 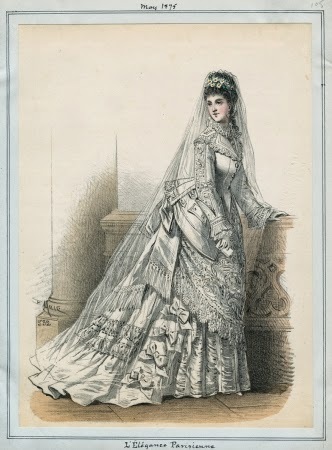 The bustle dresses always go for $$$. 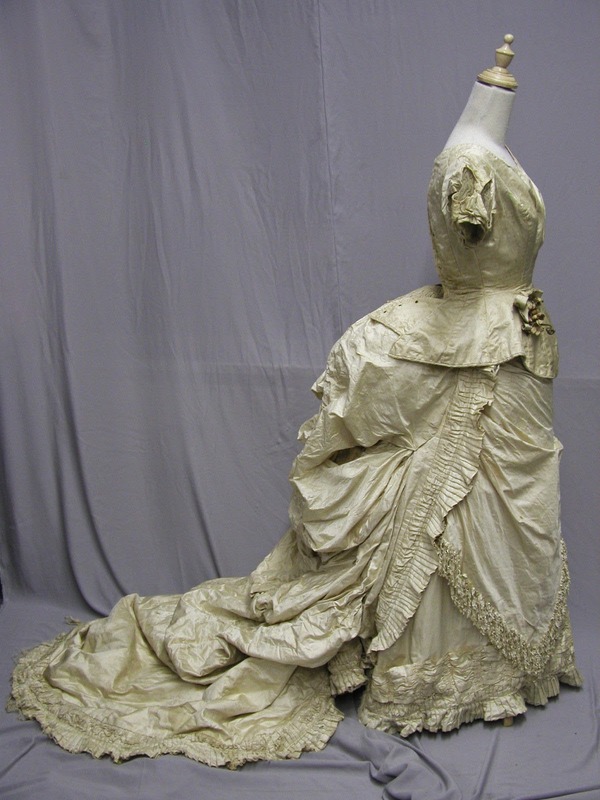 Which is why I have 4 or so Regency dresses but only one full bustle dress in my collection - the Regency dresses are cheaper! Now that is interesting. 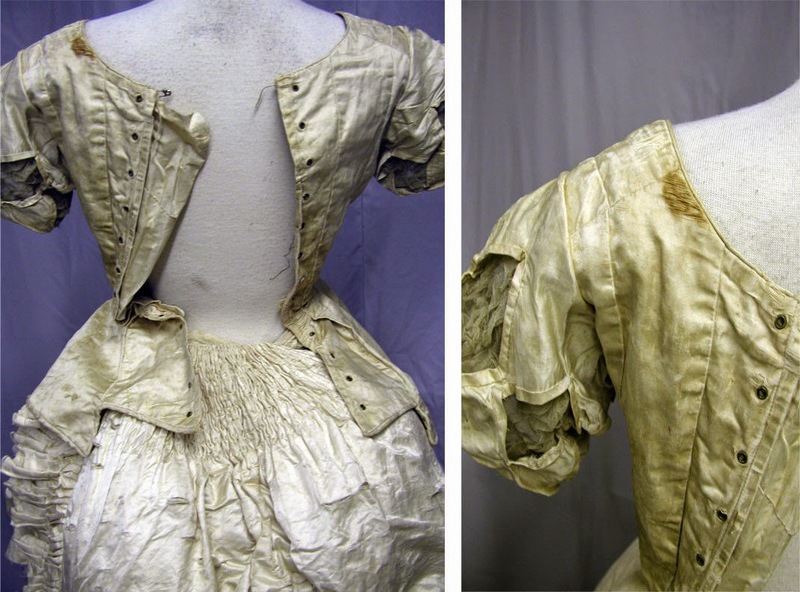 I haven't bothered to bid on Regency dresses because I assumed they would be far out of my range. I need to start looking at them.